How to Build a Bot That’s Truly Powerful? In this day and age, as a marketer, you can use a huge variety of chatbot platforms to build your own bot. Your choice of interface is equally large as chatbots can be integrated with Messenger, webchats, SMS platforms and even voice devices like Google Home and Amazon Alexa. 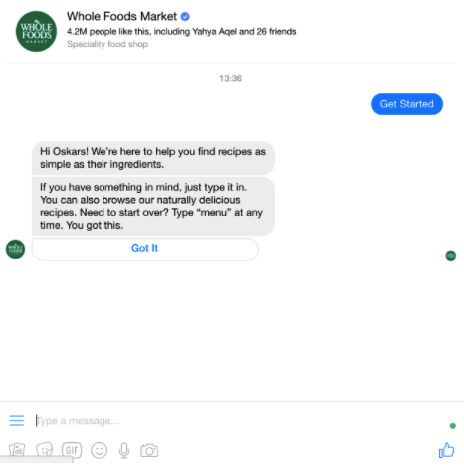 With a chatbot, your customers can purchase products, get product suggestions, get informed with push notifications, and receive answers to up to 80% of frequently-asked questions. With such a variety of different tools available, finding the right solution to your situation is key. 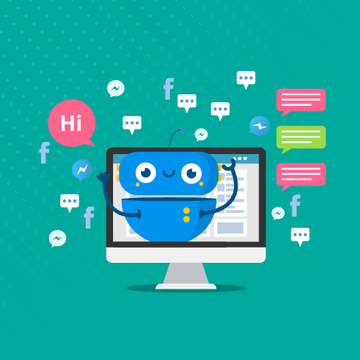 Some bot platforms have great functionalities and natural language understanding (NLU) capabilities, but often are suitable to developers only, while others are simple to use but don’t have sophisticated NLU algorithms.The Clustaar chatbot platform contains both intelligent NLU and a user-friendly interface. To choose the best platform for your situation, you first question to ask yourself is which use case what you want a chatbot for. 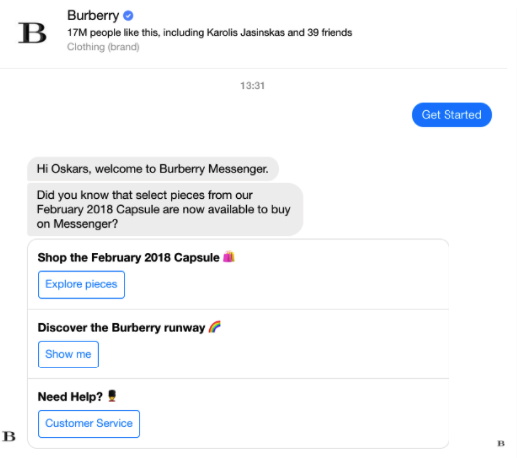 As one of the most well-known and digitally-forward luxury fashion brands in the field, Burberry has also embraced the chatbot movement. Burberry launched their chatbot during New York Fashion Week in September 2016. 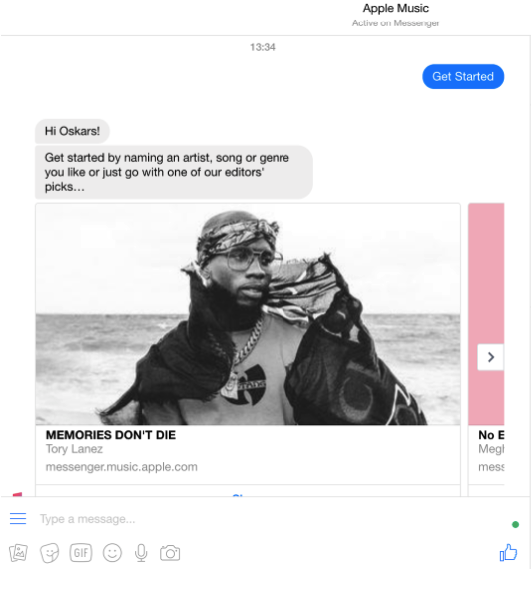 Originally, the chatbot was meant to give fans behind-the-scenes looks at their collections and let them shop some of the pieces from the show. But Burberry went above and beyond by sending push notifications to people that had recently interacted with the bot, allowing them to see unique branded content and enticing them to shop their holiday collection. Now, the chatbot is taking on more unique features such as getting customers directly in touch with a Burberry consultant, locating a particular store, or booking a Uber ride to Makers’ House to see the brand’s exhibition. Match.com is an online dating service operating in eight languages in over 25 countries. One of the more interesting examples we’ve seen is the application of chatbots in online dating. 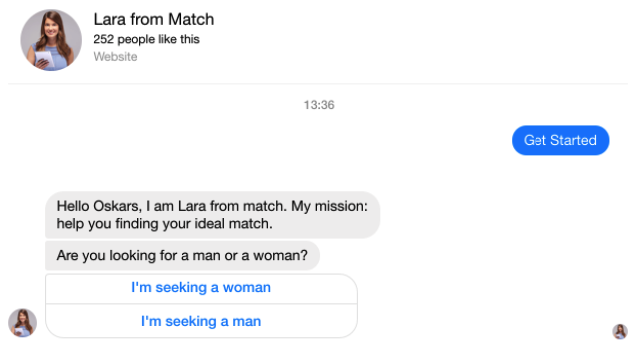 With Messenger having over a billion users worldwide, it was a great choice for Match.com to create Lara – their dating chatbot. Lara is able to engage in a personal interaction and ask users dating-related questions while getting cold hard data to provide potential dating profiles and photos directly in Messenger. The chatbot can use its artificial intelligence in 12 languages and has supported 300,000 people in setting up their online dating profiles on the site. To this day, it has upped the company’s registration rates by 30% and Match says that Lara is here to stay. 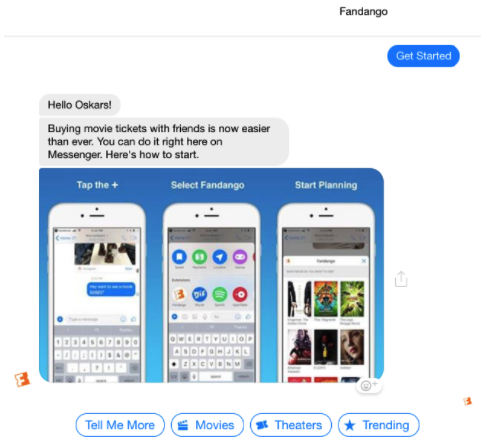 Fandango – pick the movie and buy a ticket straight from the app. You can even do it with your friends. Whole Foods – Don’t know what to cook? List what you have in the fridge to get recipes. Webikeo is a platform allowing people to stream webinars. It has over 10,000 webinars streaming to 240,000 participants. The platform allows users to chat with the webinar presenter via an interface. However, the chat would often get polluted by technical issue questions such as “I have no sound” or “the video is slow”. To solve that issue, we set up a chatbot in a separate chat interface to provide users with solutions to their technical problems. The chatbot has the ability to warn the Webikeo team that a problem is more complex than usual and requires human intervention. The results are fantastic. The chatbot has had 4300 conversations so far and has left no question unanswered. It is able to automate 75% of the technical-issue conversations, freeing the webinar chat of irrelevant topics and allowing the participants to discuss and focus on the matter at hand. Hachette is France’s biggest publishing company with over 80 publishers under its belt. Since the arrival of social media, Hachette had their first opportunity to establish a link with the public. The company needed to invent a way to communicate directly with readers other than through Community Managers who do not have enough time or training to handle this level of public relations. We built a chatbot to provide a new customer experience in the Hachette universe. We analyzed historical customer conversations to understand their needs and used these insights to build a solid chatbot conversation scenario. The Hachette chatbot was also set up with useful functionalities like book recommendations, geo-localization to find bookstores, and news pushes. The chatbot has handled more than 2000 conversations, answering almost every single question from Messenger users. The Community Manager can easily take over the conversation at any time. Want more information? 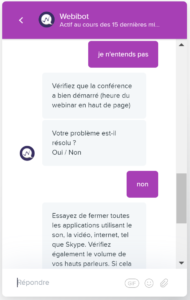 Check out our Lydia, HelloAsso and Le France Des Jeux case studies for more data on their chatbots results. Chatbots have applications beyond just answering customer questions. See our blog post about the 10 Best Customer Support Chatbots to learn more. If you are curious about how a chatbot can automate and scale your customer relationships, build a new channel for your company and reach a new audience, check out Clustaar platform.